Ethel Gray details her husband's decades of smoking prior to his diagnosis with the COPD and artery disease that Gray claims was caused by R.J. Reynolds' Winston-brand cigarettes. Health problems forced the 81-year-old widow of a long-time smoker who died after suffering from diseases allegedly linked to cigarettes to leave the witness stand Thursday, midway through cross-examination in her suit against R.J. Reynolds. Ethel Gray was testifying under cross-examination when she appeared to be in physical distress and said she felt like she may pass out. Gray's attorneys assisted her as Judge Michael Jones recessed proceedings. When court resumed, Judge Jones notified jurors that Gray would conclude her testimony later in the trial. Gray's illness, which she said on the stand was related to blood-sugar problems, came after about two hours of testimony, including about 40 minutes of cross-examination. At the time proceedings were stopped, King & Spalding’s Jeffrey Furr, representing Reynolds, was questioning Gray about her husband Willie Gray's decision to begin smoking Reynolds brand Winston cigarettes in the 1960s. On cross examination, however, Furr questioned Gray about whether her husband’s belief that filtered cigarettes were safer necessarily implied that he also knew that smoking was dangerous. Gray repeatedly answered no to different forms of the question before agreeing with Furr that her husband's switch to filtered cigarettes indicated he knew of the potential dangers of smoking. A smoker since at least age 15 according to his wife, Willie Gray smoked at least a pack of cigarettes a day for more than 25 years. He quit smoking in 1993 and was ultimately diagnosed with chronic obstructive pulmonary disease and artery disease before his death. Ethel Gray claims her husband's reliance on a tobacco industry conspiracy to conceal the dangers of cigarettes fueled his nicotine addiction and led to his smoking-related diseases. 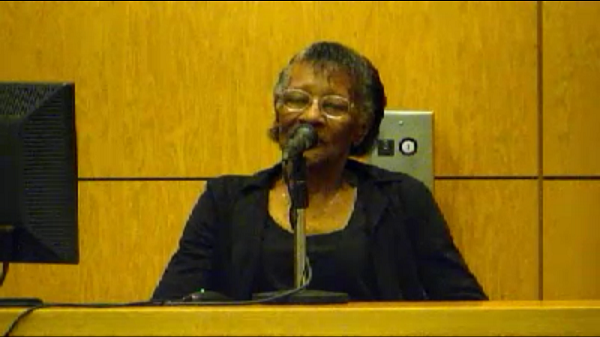 Earlier in the day, Ethel Gray detailed for jurors the culture of the rural Alabama region in which she and Willie Gray had been raised. Gray, the daughter of African American sharecroppers who lived on a farm in a segregated town, said her family and friends had no idea in the 1940s and 50s that smoking was dangerous. Smoking was so accepted, she said, that when she was 18, her doctor told her to begin smoking to stop her from spitting. Gray also testified that her husband was a smoker when she met him and had developed a pack-a-day habit by the 1960s after the couple moved to Pensacola, Florida. By that time, the couple saw various tobacco industry commercials, including Winston ads, which she says convinced her husband to begin smoking the brand. Gray told jurors that her husband typically placed buying cigarettes ahead of groceries on the couple’s list of weekly errands. Cigarettes “[were] at the top of the list,” she said. A key point of contention in the trial, however, is whether Willie Gray smoked enough Reynolds cigarettes to link them to his diseases. During opening statements last week, Furr told jurors that Gray continued to smoke hand-rolled cigarettes even after he began smoking Winstons. Furr said many of Gray's coworkers claimed to have never seen him smoke a commercially manufactured cigarette. "Despite working next to him day after day, year after year, despite being friends with him,” Furr said. “They told us they just never saw him smoke a manufactured cigarette. There were others who said they did, but it's very unclear how much he smoked manufactured cigarettes, and how much he smoked roll-your-own cigarettes." Next week: The jury is expected to receive the case by the end of next week.